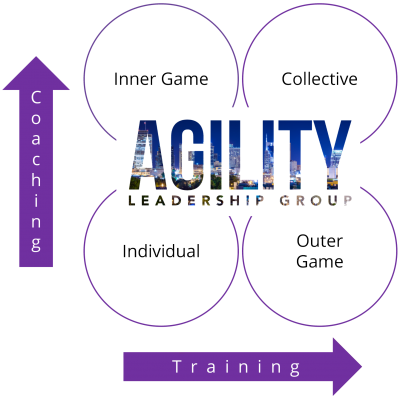 At Agility Leadership Group, we specialize in your toughest business and leadership challenges. We follow a simple process whether we are working with you to solve a business threat or help a leader or team maximize and improve their results. We start with open dialogue and interviews to learn about your goals, challenges and what success looks like so we can make sure we achieve your goals quickly. Confidentiality is critical in the work we do. We recommend an NDA so we can speak freely. We do our best work when we get to the heart of the matter quickly. The interview process and our training allows us to learn what we need to know in the quickest time possible. There is no need for a 6 month exploratory process with a giant bound report. Your problem won’t get any smaller while this is taking place. Our secret sauce is that we save you valuable time and get you the results you need. Whether we are working at the individual, team or organizational level our work is designed to have an immediate and lasting impact. These are some of the development tools we have used with our clients. Some are profound and life changing and some are simple and easy to access. We will recommend just what you need when you need it. Most leadership development only pays attention to developing the skills (outer game) of an individual leader, but we know that games are won or lost by a player’s mindset (inner game) and in today’s world it also matters how the players play together (collective). We deliver experiences that develop the inner and outer game of leaders and and collectively develop teams so they win. This is what gives you a competitive advantage. Here are some examples of what we have done with other clients. New Leader Assimilation: (1/2 Day – 1 day facilitated program) Quickly build trust and identify potential landmines for new leaders to decrease time to productivity. 5 Functions of a High Powered Team: Identify the team’s specific strengths and challenges to build a high performing team that’s aligned around a common goal. Intro to MBTI / Leading & Coaching using MBTI / MBTI Temperaments 1/2 Day – 2 Days focused on preferences around where we get our energy, how we prefer to take in information, decision making, orientation to the world. The workshop take a fun look at how they play out in the workplace so you can recognize and appreciate differences. Conflict Workshop 1/2 Day – 1 Day to encourage productive conflict in the workplace. This workshop introduces the 5 conflict modes, what skills are needed and when to use each mode. It reveals the preferred and non preferred styles of the leader and the pitfalls of over or underuse. Immunity to Change – ½ day session to reveal the “immunities” that stand in the way of making the change they desire the most. Uncovers the hidden beliefs that sabotage you repeatedly and prevent you from reaching your most important goals. Is your mindset growing as fast or faster than your business? Our Executive Coaching helps you work on you and your Inner Game. Most games are not won or lost because of lack of skill but lack of inner game … so what are you doing to make sure you are ready for what’s coming? We know it takes strong leadership to grow a vibrant and profitable company. We provide the perspective and expertise you need to develop your strategies, and stay on or get back on your growth trajectory. One on one consultation – We consult one on one with team leaders to help them solve issues in their division or business unit. Custom Off-Site Creation: We facilitate strategic time away from the business to work on your leadership team and/or the business. Results drive your success. Everything we do will have a measurable impact. Can you afford to wait? Contact Agility Leadership to start the conversation.